Soda Blasting NC provides the ultimate in mobile and in-house paint removal and surface cleaning using efficient, economical, non-abrasive, environmentally safe, non-toxic, non-hazardous, non-flammable, water soluble baking soda. Our mobile units have the ability to blast wet or dry depending on the job. If customers can’t come to our Winston-Salem facility, we are happy to go to them. Soda blasting can also remove carbon, grease, oils, mold, rust, and any other surface coatings without causing damage to glass, rubber, engine components, fiberglass, or precious metals. Soda Blasting NC uses only the patented Buster Blaster soda blasting system manufactured by The Soda Works, Inc. in Washington State. 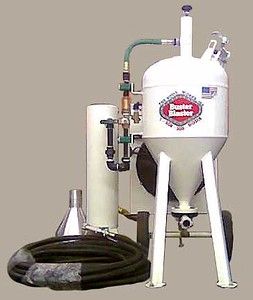 We have looked at a number of manufacturers who were calling the equipment they were selling “Soda Blasters” and we have found only the Buster Blaster system was designed from the ground up specifically and only for soda blasting. We can also sand blast and power wash when the project calls for those services. We have the experience and the equipment to do all three. We are happy to recommend the best solution for every project. For multimedia projects click here to visit Technical Blasting Company, the industrial arm of Soda Blasting NC, LLC. Owner, Rick Prendergast has nearly 20 years experience in the painting and resurfacing business. He is a skilled finish carpenter and fine painter as well. His technicians, Chris Barrow and Jeff Morris also have over two decades of similar experience. They have been removing paint and cleaning surfaces by sand blasting, power washing and using other techniques to prepare surfaces for painting for years. Rick and his wife Debbie had substantial damage done to their house in a fire at the beginning of 2009. He was introduced to soda blasting when he had to clean the remaining wood and masonry on his house. When he saw the exceptional results first-hand, he was convinced of the merit of the new technology and immediately invested in several mobile units and all the related equipment. The related equipment included the purchase of a 5,000-square foot building and upfitting the facility for his highly specialized work. The upfitting includes a 650-square foot drive-in, enclosed blasting booth. Rick’s years of experience in the painting field gave him a professional insight on the different types of paints and coatings and their reactions to different methods of blasting for paint removal and cleaning. Soda blasting is revolutionizing the business of restoration and preservation of homes, equipment, and vehicles, and his soda blasting and painting services are in demand. Call today. Ricky will be happy to give you a competitive quote for your next project.